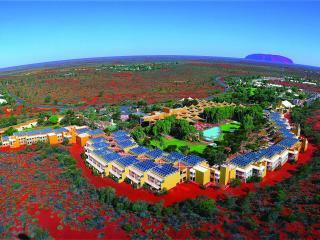 Ayers Rock (Uluru) accommodation offers a surprising range of comfort, quality and facilities. 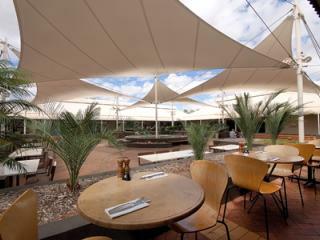 Despite its remote location, Ayers Rock (Uluru) features a wide range of accommodation options within the Ayers Rock Resort complex including hotel rooms and self-catering apartments which enjoy an excellent range of onsite facilities including swimming pools, dining options, activities and much more. There is also a unique outback accommodation experience available at Ayers Rock (Uluru) featuring luxury safari tents which allow you to experience 'camping' in the outback without sacrificing on all the creature comforts. Rising up from the red earth with its trademark white sails, this resort features 5 star accommodation and facilities. Surrounded by native flora and fauna, this hotel offers luxury accommodation shaded by a grove of ghost gums. The remote nature of Ayers Rock (Uluru) means that it is not as simple as a quick flight or drive like many other holiday destinations. It also means that accommodation options aren't as plentiful as in other places so it becomes even more important to ensure you are choosing the right option for you. Ayers Rock holiday packages are a great way to take care of all these special needs as well as enjoying significant savings in the process. By combining flights, transfers, accommodation and that all important travel insurance with added extras like meal packages and the amazing range of tours on off, you can make the most of your time in the Australian outback and ensure that your visit to Ayers Rock (Uluru) is a memorable one for all the right reasons. There are three main attractions at Ayers Rock (Uluru) including of course, the 'rock' itself as well as The Olgas and the Uluru-Kata Tjuta National Park. Ayers Rock (Uluru) is the largest single rock on earth at 348m high, 3.1 km across, 1.9km wide and 9.4km around the base. It is a spectacular natural attraction with deep cultural and spiritual significance to the local Aboriginal people and is also a wonder of the world. The Olgas are a group of 36 rocky outcrops which are also a popular and well-known attractions. The highest of these, Mount Olga, is the focal point at the centre of the Uluru-Kata Tjuta National Park which offers a unique insight into the flora, fauna, history and culture of this magnificent outback land. A cultural centre is located at the base of Ayers Rock (Uluru) which offers interactive exhibits, traditional Aboriginal artwork and informative video presentations to provide a thorough introduction to this icon.